Specially designed mounting brackets, spherical bearings, self-centering setup cones, and movable rotational drive and feed units simplify setup and allow the tools to work in spaces too tight for most line boring machines. 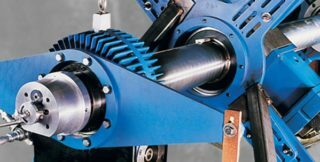 All models feature rugged rotational drive and axial feed systems, precision bars and heavy duty bearings, with electric, pneumatic and hydraulic options. They have the ability to share the same mounting system with Auto Bore Welding Systems for single-setup machining and welding.